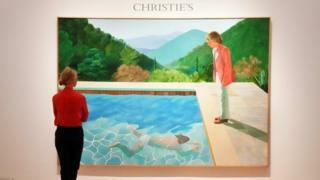 A painting by British artist David Hockney is set to become the most expensive work by a living artist to ever be sold at auction.Portrait of an Artist (Pool with Two Figures) is estimated to be worth $80m (The current record belongs to American Jeff Koons. His stainless steel Balloon Dog (Orange) sold for $58m in 2013. "Right now, the price level for this painting is set in the region of $80m, which doesn't mean I want to cap it there, but that's where we place it within the context of market history," said Alex Rotter, co-chairman of Post-War and Contemporary Art and Christie's. One of the Yorkshire painter's most recognisable works, the composition of the two figures began as two separate photographs on the artist's studio floor.It was completed in time for an exhibition at New York's Andre Emmerich Gallery in 1972.It has since appeared in a number of retrospectives at the Tate Modern, Centre Pompidou in Paris and the Met in New York.Earlier this year, another of the 81-year-old's paintings sold for $28.5m (?21.1m) - a personal auction record for the artist. Christie's has not disclosed the private seller, but Mr Rotter added: "It is this rare coincidence - when the best painting of an artist is actually available. "With this painting, Hockney cemented his placement within the realm of history's most venerated artists, and come November, it is poised to become the most valuable work of art by a living artist ever sold at auction. "The painting will be exhibited in Hong Kong, London and Los Angeles, before it is auctioned on 15 November in New York. » When will an auction house sell the first $1bn painting?